BERLIN, Nov. 28, 2018 /PRNewswire/ -- Nintex, the global standard for process management and automation, today shared early findings from a new SharePoint360 digital transformation study of more than 280 business decision makers based in Germany, Austria and Switzerland. The research, of which Nintex is a platinum sponsor, reveals that 66 percent of decision-makers see limited IT resources and 'bottlenecks' within the IT department as an obstacle to adopting more digital solutions. When 76 percent of leaders pursue digital transformation for productivity gains, these process breakdowns and inefficiencies within IT departments will negatively impact a company's ability to achieve their goals. The findings come from a soon-to-be released study which surveyed decision-makers at companies in Germany, Austria and Switzerland with more than 500 employees from July to September 2018. The study was conducted in partnership by Stuttgart Media University and IT portal SharePoint360.de together with Nintex, harmon.ie, novaCapta, IPI, Webcon, Impactory and Blueprint AG. The full report will reveal why business leaders in the region pursue digital transformation initiatives and the technologies that are powering their digitisation initiatives. "True digital transformation is possible when organisations equip their IT teams with the right technologies to quickly and powerfully automate their business processes," said Felix Gremlich, Nintex's VP Sales EMEA. "When IT departments digitise workflows and use automation technologies across departments, they empower line-of business employees to automate their own time-consuming manual processes and paper-based forms. The result is reduced bottlenecks and more efficient workflows throughout the organisation, allowing IT professionals' to focus on more strategic work." 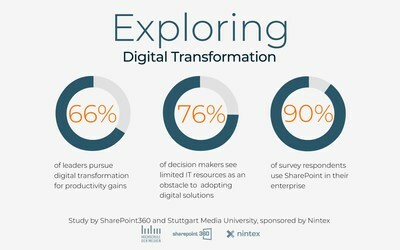 To drive these digital transformation initiatives, more than 90 percent of respondents use SharePoint and more than half also use SharePoint Online or Office 365. The study reveals collaboration tools (59 percent), like SharePoint, and workflow automation software (53 percent), like Nintex that easily integrate with SharePoint and Office 365, top the list as the technologies seeing the greatest investment across the enterprise. "If additional SharePoint integrations aren't already a part of a company's plans in the region, they soon will be," said SharePoint 360 Founder Wolfgang Miedl. "In fact, two-thirds of organizations we surveyed plan to integrate more technologies to further extend the value of their SharePoint investments." More specifically, the majority of those (85 percent) who participated in our research are already using workflow automation technologies or plan to in the very near future, Miedl added. The complete research findings will be available in early 2019. To sign up for a complimentary copy, go to https://www.nintex.com/resources/digital-transformation-study/.